Today we celebrate Dr. Martin Luther King Jr! He was man who effectively changed the country and the world. We are grateful for his bravery and steadfastness in fighting for civil rights. Dr. King had a unique ability to speak. He was good with words and was able to articulate what he was feeling and thinking in a way that people from all walks of life could understand. Dr. King was held in high esteem by people from all classes, whether they be sharecroppers or doctors. 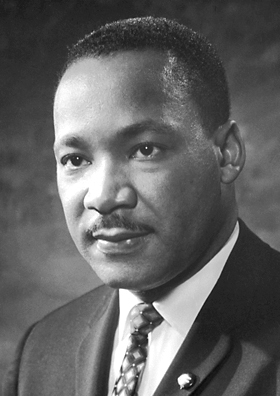 Dr. King possessed many qualities that made him the perfect man for the job of leading a movement. Was he perfect? Not even close. But his personal imperfections do not erase the good he did while he was alive. Dr. King led with nonviolent protest. He studied the teachings of Gandhi and even visited his birth place in India. He felt that it was not only the right way to protest, but that it was right in God’s eyes. Violence is for people that are impatient and it never results in success in creating the change you want to see. Dr. King possessed what seemed like infinite patience. During his time as a civil rights leader, he was arrested and jailed over 29 times. He never fought back when he was harassed or attacked. He remained calm, sticking with the principles of nonviolent protest. You cannot change the world if you cannot get along with others. And Dr. King knew this. He had an ability to be friends with all kinds of people, whether they were in power or not. He developed a kinship with President John F. Kennedy and President Lyndon B. Johnson. He marched with people both black and white, rich and poor. He made time for all kinds of people, whether they agreed with his views or not. Dr. King felt that you can find common ground with anyone, and that thread of commonality can be just the thing that plants seeds of change. Before Dr. King was a man of civil rights reform, he was a man of God. He grew up attending the church where his father was the reverend. He developed a love for God early on and followed in his father’s footsteps. He believed in serving others and listening to them. It was these characteristics that gave him a sensitivity to those oppressed and downtrodden. We would all do well to pick one of these character traits to work on as we celebrate Dr. King and all he did for humanity. As we develop these traits, we are one step closer to being the needed change in our own communities.